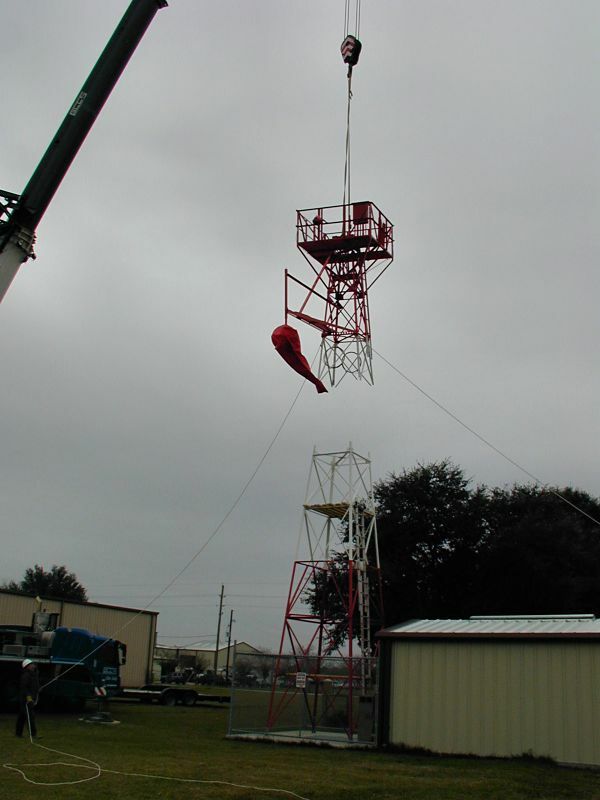 Located at the southern edge of a residential airport on the west side of Houston stands a 42ft tower that is nearing the end of a long relocation and restoration effort. 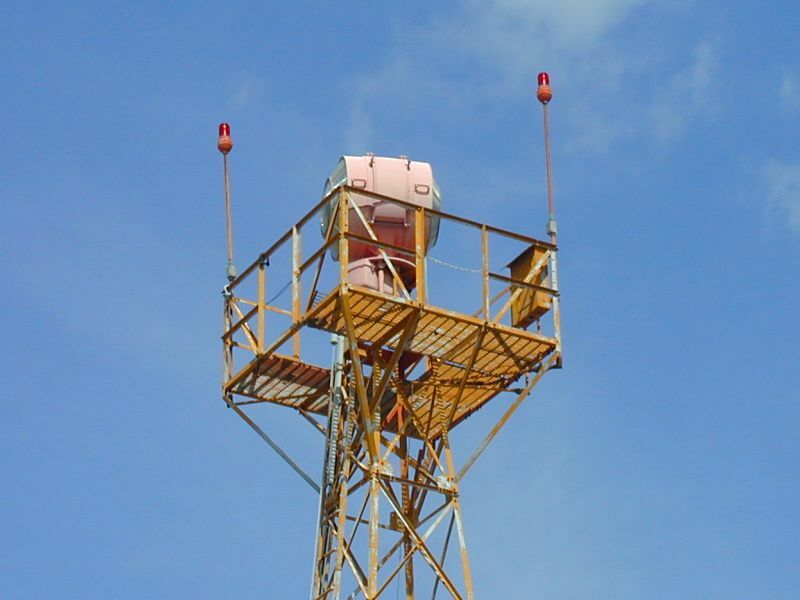 This tower is one of the last few survivors of the 1920s Federal Lighted Airway Beacon System. Following the completion of the Transcontinental Railroad in 1869, coast-to-coast postal mail was carried by the railroads. While this was a tremendous improvement over the prior carriage by overland stagecoach or by steamship through the Isthmus of Panama, it still required extensive handling of the mail, and its resultant delays, as it was transferred between railroads over the length of the five-day trip. On 1 July 1924, postal authorities began regular around-the-clock operations (establishing the first scheduled air operations in the US). Responsibility of the airway was transferred from the Post Office to the new US Department of Commerce Airways Division upon its creation in 1926 and the construction of additional lighted airways soon followed. A southern east-west transcontinental airway was completed between Los Angeles, CA and Atlanta, GA in 1931 and this route passed through Dallas, TX. Dallas was then connected to Houston by a short north-south airway, then Houston-to-San Antonio, Houston-to-Austin, Houston-to-New Orleans, etc. By 1933, more than 18,000 miles of federal airways were marked by 1,550 beacons spaced at 10 to 15 mile intervals across the US. Following WWII, the rapid advancement and availability of in-cockpit electronic navigation equipment made the old lighted beacon system obsolete and it was decommissioned and dismantled in the late 1950s and early 60s. 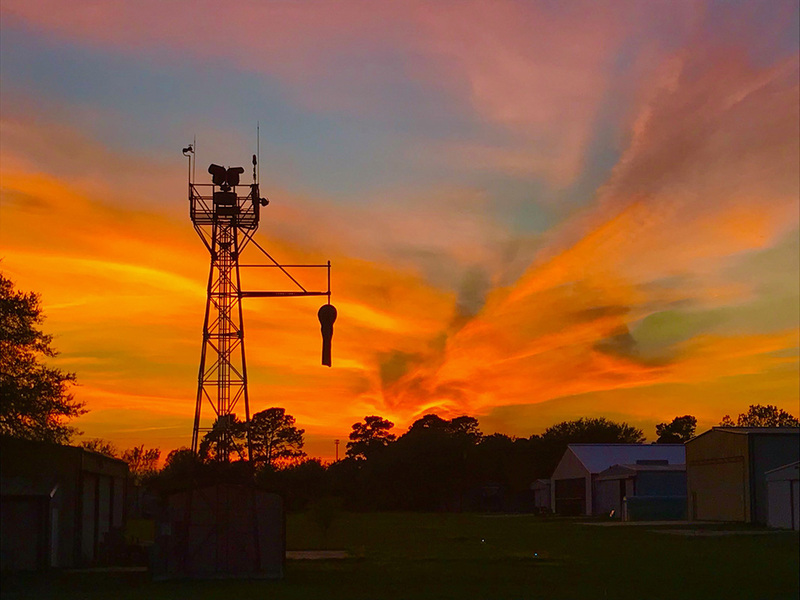 The beacons and their towers were then donated to municipal airports for use as airport beacons—one apparently ending up at the La Porte Municipal Airport on the southeast side of Houston. 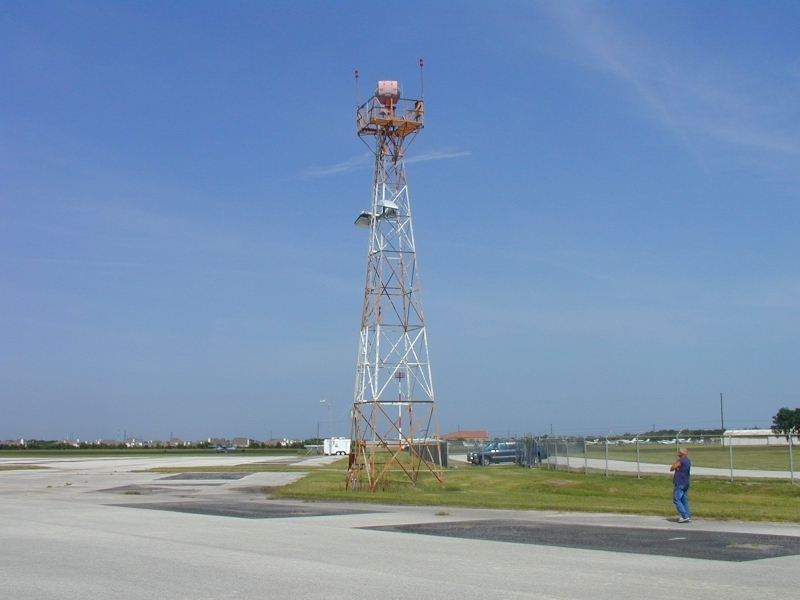 In 2004, the city of La Porte received a federal grant to modernize its airport lighting facilities and this included replacing its old rotating beacon and tower with a modern version. At that time, our own decrepit and failing beacon was already deep into borrowed time and wasn’t worth repairing any more. 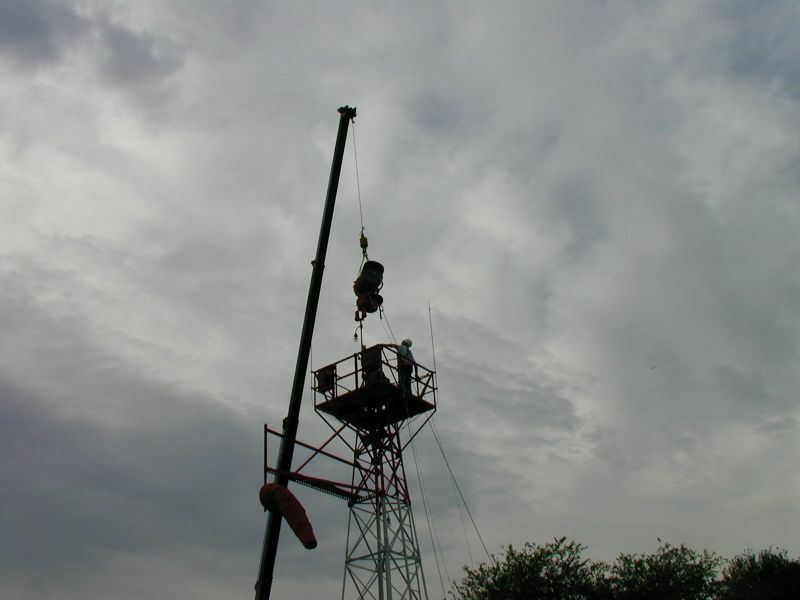 A deal was made and the La Porte tower and its beacon were dismantled and moved to our airport. Upon delivery to Sky Lakes. 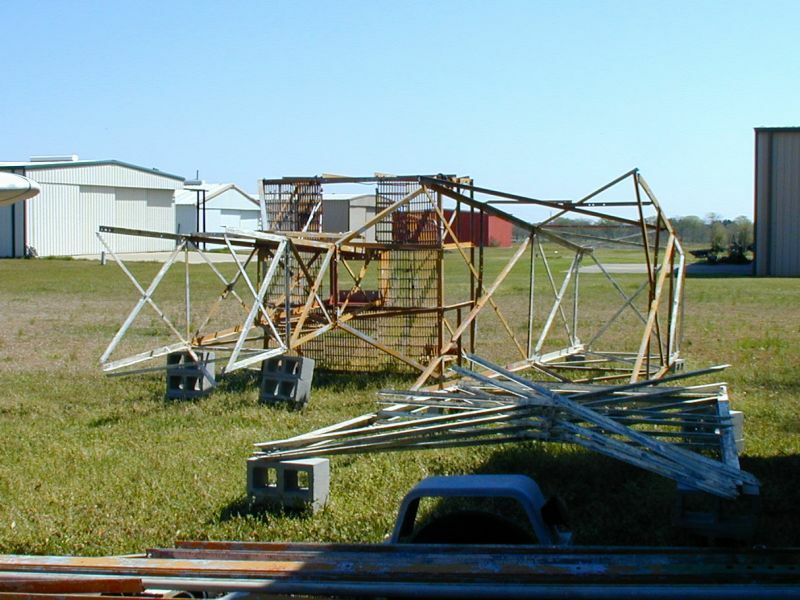 July 2005: Upon delivery to Sky Lakes. 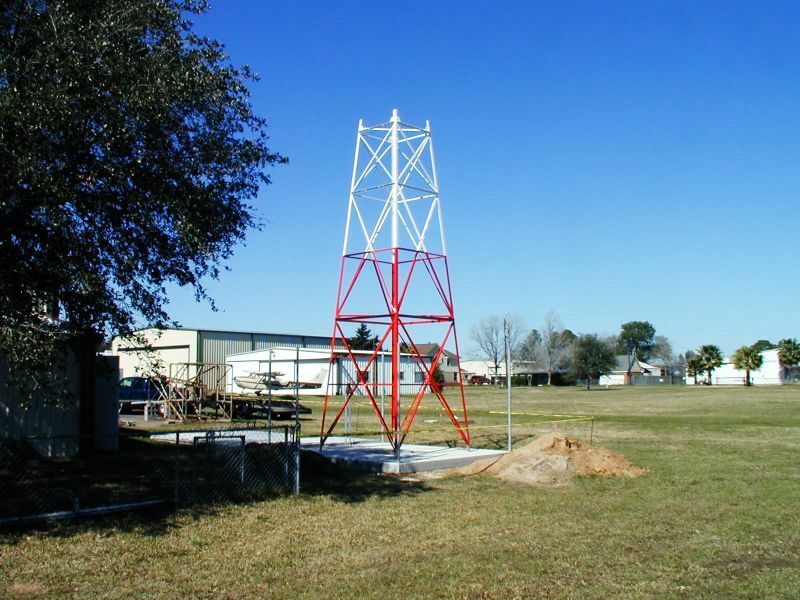 La Porte’s steel beacon tower was built by IDECO (the International Derrick & Equipment Company, one of the major suppliers of towers for the Federal Lighted Airway Beacon System) during the late 1920s. For being 85+ years old, the old tower was still in very good condition, owing much of its long life to the six to eight coats of thick paint on top of a galvanized undercoat. 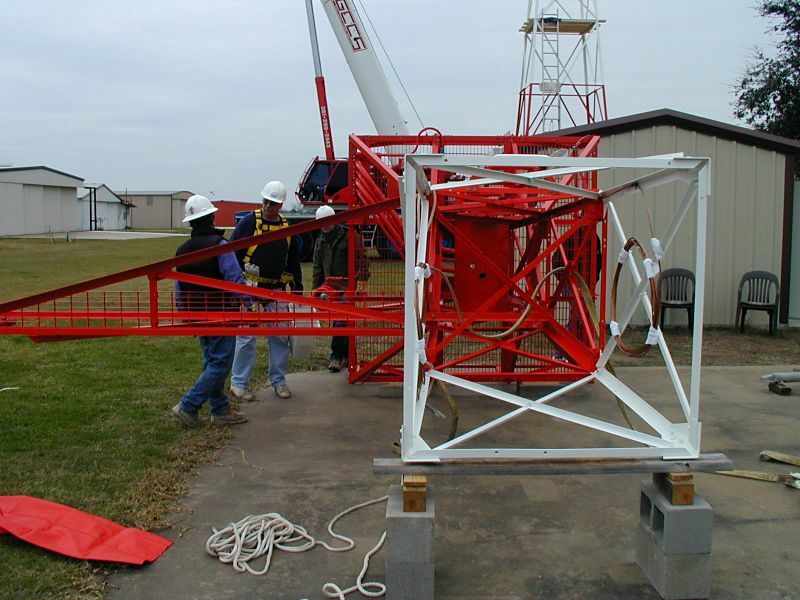 Nonetheless, the tower was thoroughly sandblasted, inspected, rebuilt piece by piece, and repainted in Aviation Orange and Aviation White colors. Teaser image ... a new beacon is coming! 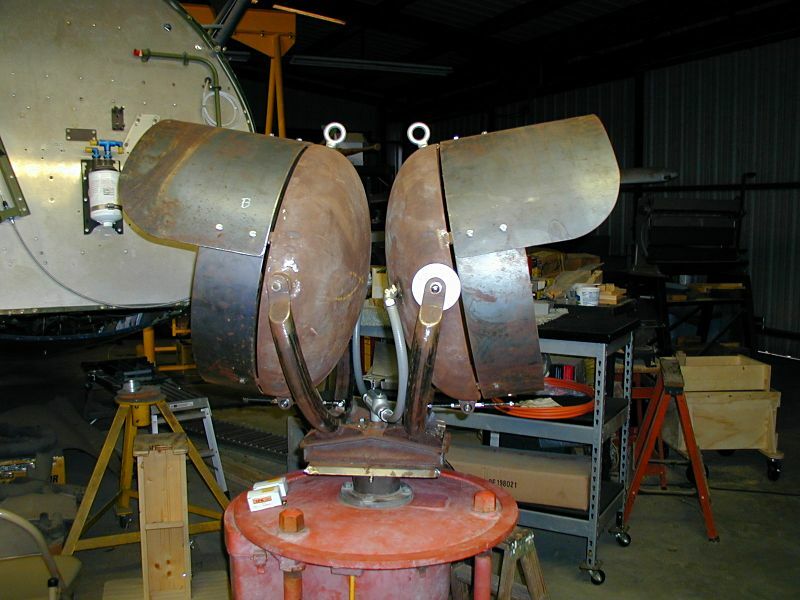 The beacon assembly that came with the tower was a 1938-40 Crouse-Hinds model DCB-36 (built specifically for the Civil Aeronautics Authority) with a 12rpm rotator mechanism. 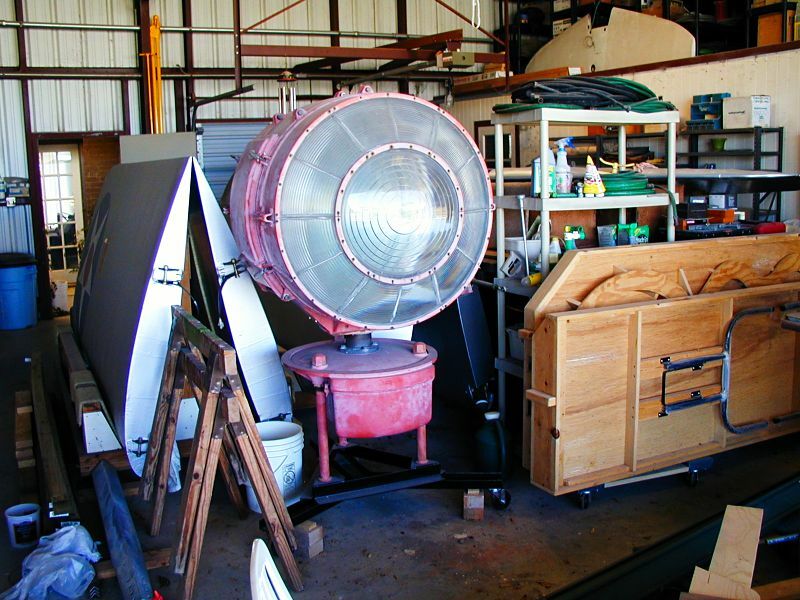 The beacon was still operational but due to the scarcity of replacement parts, that beacon has been retired and a replacement (“counterfeit”) beacon has been fabricated. 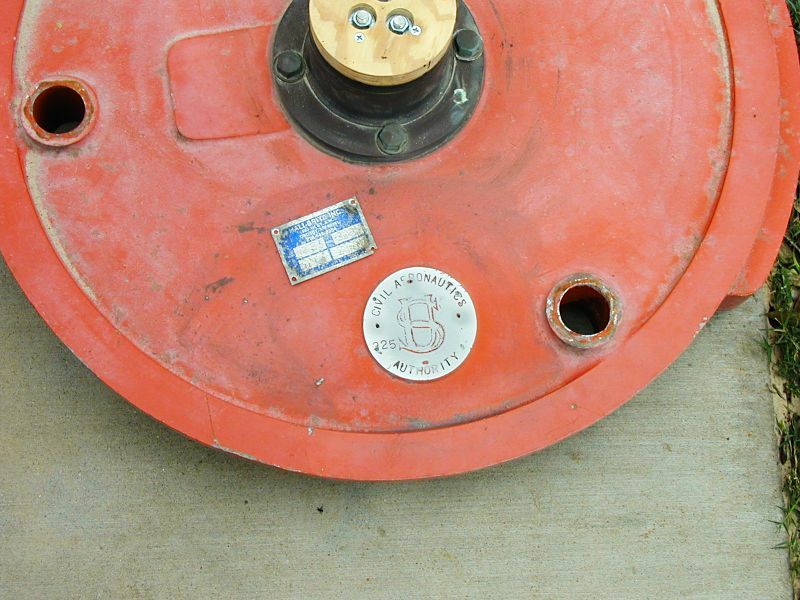 The La Porte beacon, as well as our original beacon, were controlled by simple photocell switches and they operated all night, every night. However, our new beacon will be pilot-controlled (via microphone “clicks”) in order to limit its operational time, thus reducing its maintenance and electricity costs. 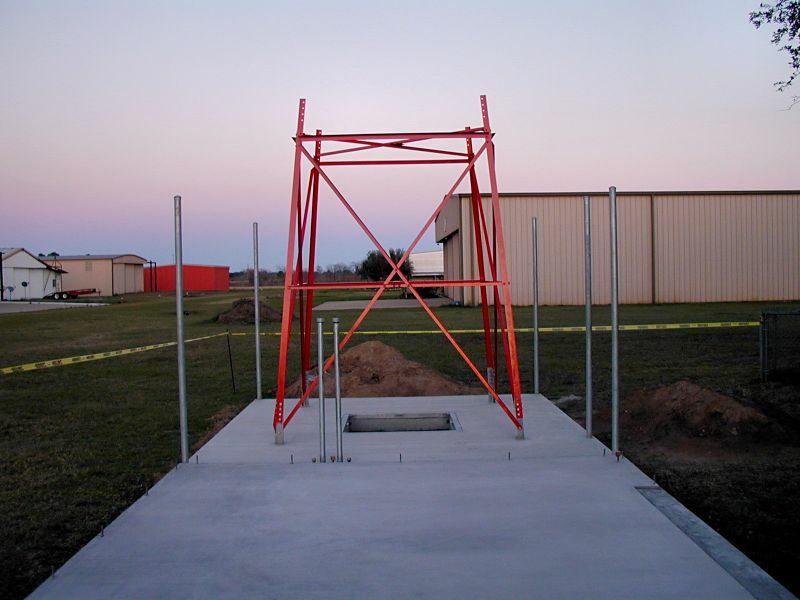 Its fresh coat of paint belies our “new” beacon tower’s long history of guiding pilots through the night skies. 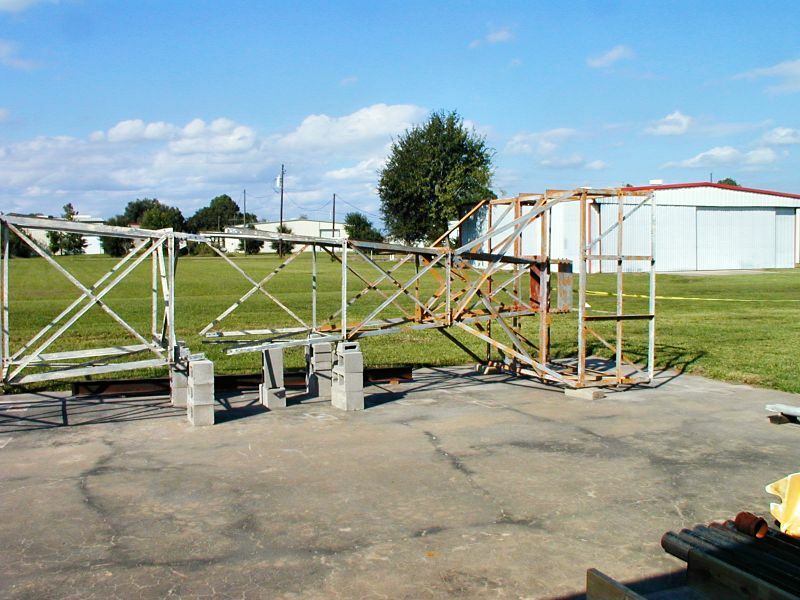 The construction of the Federal Lighted Airway Beacon System in the 1920s and ‘30s enabled scheduled around-the-clock flying for the fledgling U.S. Airmail Service and is regarded as the birth of commercial aviation in the U.S. Of the original 1550 towers, only a few dozen are known to exist and of those, only a small few have been restored. Our tower is one of those few! All photographs by Harvey & Theresa Hartman, Stan Weiss, and James Hancock. Note: Parts of this article originally appeared in the 30 November 2016 edition of The Waller Times newspaper of Waller, TX. Used here with permission. 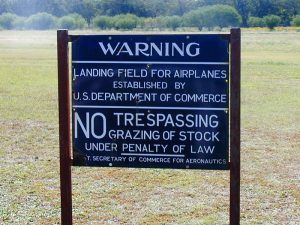 During the early years of the Federal Lighted Airway System, government specifications called for the construction of emergency landing fields (often not much more than cleared fields leased from area farmers) co-located with every 4th beacon site along the airways. 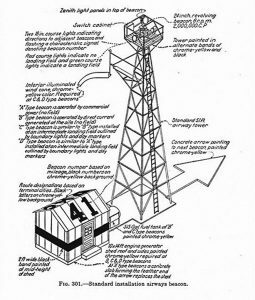 In addition to their white rotating beacons, the towers were also equipped with fixed (non-rotating) 18” diameter course lights that shone up and down their airways towards the previous and next beacon sites and visually defined the airways. 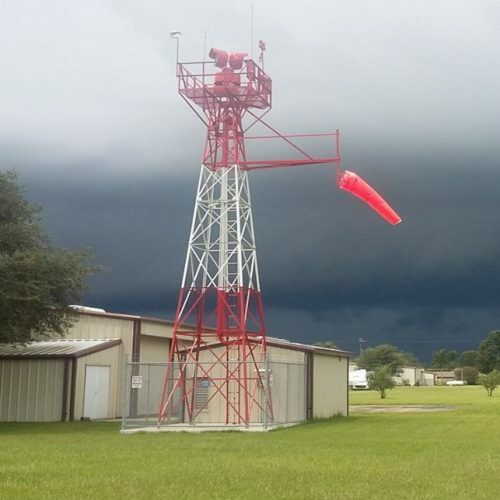 When no emergency landing field was nearby, the course lights were red. However, if a beacon site included a co-located landing field, the course lights were green. This is why civil land airport beacons are green and white to this day. ← Airway Beacon .kmz Files Available! This is cool stuff. My brother and I have recently purchased a plot of land that has one of these towers on the top of the mountain. It has IDC badges. And serial number. There is also another about 1 miles away on the next mountain top. Both are in decent shape but no beacon on top. We climbed them growing up as kids. Thank you for your interesting and informative web page. 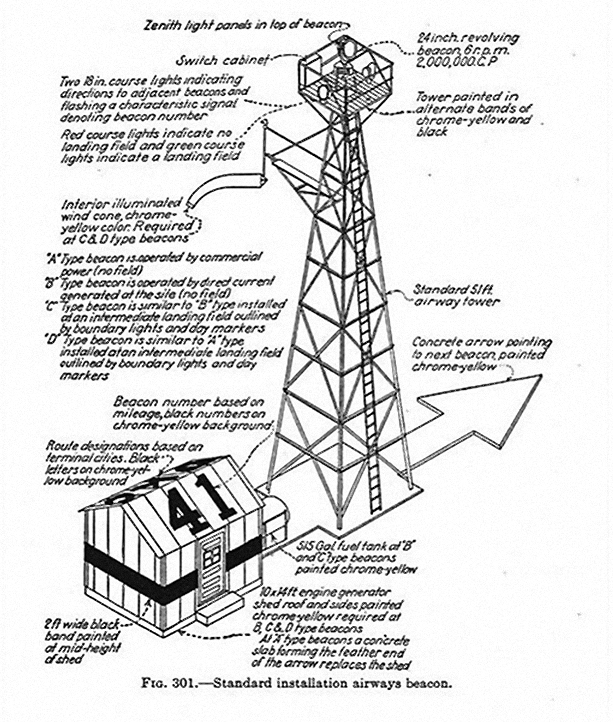 I am involved with the planning for the restoration of the Rock Rift Fire Tower in the Town of Tompkins, NY. It is also an International Derrick Company tower. I recently visited the Gomer Hill Fire Tower in Lewis County, NY on Gomer Hill Road. 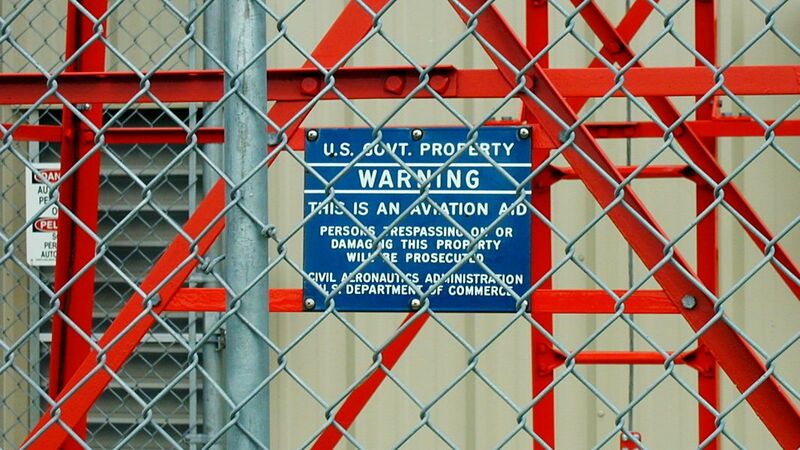 It is an IDECO Fire Tower that is on a site with four FAA towers that appear to be IDECO towers as well. Don’t go by appearance to determine the builder of a particular tower. Look for a builder’s plate which is usually attached to one of the horizontal members of the bottommost tower section. After the Department Of Commerce took over the Lighted Airway System from the Post Office in 1926, tower construction specifications were developed that standardized the towers, Therefore, regardless of who made them under contract for the government, they all looked the same under the DoC. However, while that implies that the parts should be interchangeable, it’s not always the case.